Leading the way: Jordan Spieth reacts to the cheering gallery as he makes a birdie on the 16th hole. A DAY after dislocating his ankle, Tony Finau amazingly found himself in contention on his Masters debut as Jordan Spieth assumed his customary position on top of the leaderboard. Spieth eagled the eighth and fired five birdies in succession on the back nine to card an opening 66 and finish two shots ahead of Finau and Matt Kuchar. Tony Finau: Hobbling into contention. Rory McIlroy was just a shot further back after breaking 70 in the first round for just the second time, with crucial par saves on the last three holes completing a 69 in pursuit of the win he needs to complete the career grand slam. And former Open champion Henrik Stenson celebrated his 42nd birthday in style by joining McIlroy in a seven-strong group on three under which also included Patrick Reed, Rafa Cabrera Bello and China’s Li Haotong. Having led from start to finish in 2015 and for 54 holes in defence of his title, Spieth has now led or shared the lead after nine of his 17 rounds in the Masters. In comparison, Tiger Woods - who struggled to an opening 73 in his first competitive round at Augusta National since 2015 - has led nine times in 79 rounds. Chipping up: Yorkshire's former Masters champion Danny Willett chips to the first green. “I know as well as anyone that anything happens at Augusta National and I’m not going to get ahead of myself,” said Spieth, who blew a five-shot lead with nine holes to play in 2016. The performance of Finau was arguably even more remarkable given the sickening injury he suffered during the pre-tournament par-three contest. Finau was running backwards in an enthusiastic celebration of a hole-in-one on the seventh, when his left ankle buckled underneath him. 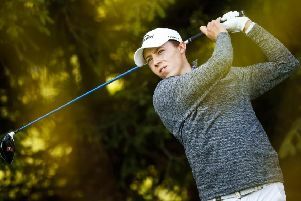 Into action: Yorkshire's Matthew Fitzpatrick strikes on the first hole. The 28-year-old then appeared to pop the dislocated ankle back into place, but subsequent X-rays and an MRI scan revealed a high ankle sprain and no significant damage. “After what happened to me in the par-three contest and the way I felt this morning, there was no way I thought I would be in this position,” said Finau, who admitted he found footage of the incident tough to watch. “On a scale of one to 10, the pain was 10 for sure. It was pretty excruciating. I was quite embarrassed but I said the last thing that’s going to happen is me getting carried out of here on a stretcher celebrating a hole-in-one. The same could not be said for defending champion Sergio Garcia, who carded an 81 after taking an amazing 13 shots to play the 15th hole. Garcia dumped five balls into the water on the same par five where he made a vital eagle in last year’s final round, surpassing the previous highest score on the hole of 11 shared by Jumbo Ozaki, Ben Crenshaw and Ignacio Garrido. Phil Mickelson and Rickie Fowler both carded rounds of 70, while Tommy Fleetwood recorded a 72 - while playing alongside Woods - which was matched by Justin Rose. World No 1 Dustin Johnson and two-time champion Bubba Watson were alongside Woods on one over, with Ian Poulter carding a 74 matched by Sandy Lyle on the 30th anniversary of his 1988 triumph.